Lightweight and maneuverable it transports easily in a pickup. 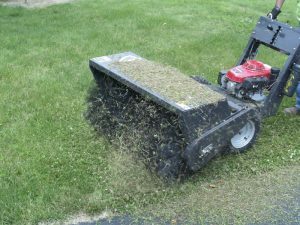 The 5.5 hp Honda engine powers the 36″ wide, 24″ diameter two speed brush, (specify poly or poly & wire mix). A transmission with differential provides 5 speeds forward, neutral and reverse. The large tires and differential provide excellent traction and outstanding maneuverability. Truly a 4-season cleanup machine on pavement and turf cleaning thatch, gravel, snow, and more.